A study by the MedTech West researcher Malin Åberg-Björnsdotter published on 20 April in the scientific journal JAMA Psychiatry shows that a new method for measuring brain activity can distinguish autism in boys. The results may lead to new methods for e.g. evaluating effect of treatments. 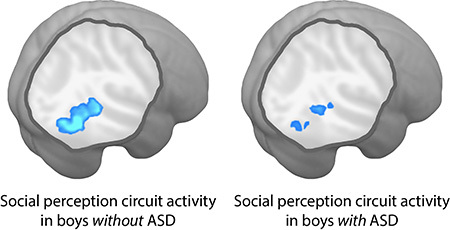 Malin Björnsdotter, researcher at MedTech West, the Sahlgrenska Academy and Linköping University, has in collaboration with researchers at Yale University and The George Washington University in the US developed a new method for identifying and tracking functions of the brain that are affected in autism spectrum disorders (ASD). The method provides a quantitative measure of activity in a certain brain circuit linked to social interaction- something that people with ASD have difficulty with. - Behavioral symptoms of ASD are so complex and varied that it is difficult to determine whether a new treatment is working, especially within a realistic time frame. Biomarkers can provide specific and objective measures that are easier to assess. 114 children with and without ASD diagnosis participated in the study. While the children’s brain activity was recorded with MRI, they got to watch movies where characters made of light points were moving in different ways. The results showed that activity in the social perception brain circuits with high accuracy do reveal ASD in both young and older boys. The results also showed that the method wasn´t successful for girls with ASD. - ASD is almost five times more common in boys than in girls and we don´t know why, says Malin Björnsdotter. The results indicate differences in how ASD is expressed in the brain, but to understand the underlying mechanisms, we will now look closer on girls with ASD. The study also shows that applied neuroimaging may be an option in a future patient-centered psychiatric care. Malin Björnsdotter emphasizes that physicians today don´t have access to the specialized and expensive imaging equipment that was used in the research, but the ambition is to eventually develop cheaper and simpler methods that they can use. The research team will now continue to make further studies on an even larger group of people with ASD and other neuropsychiatric disorders.